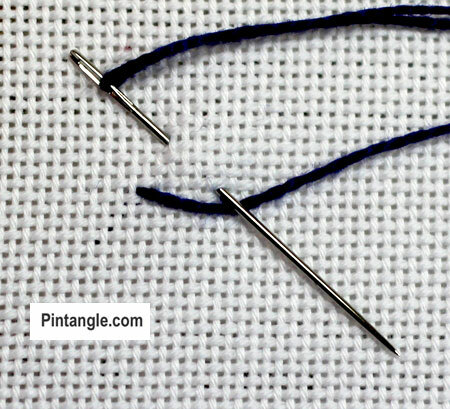 Rosette of Thorns is actually a variety of Buttonhole stitch. If you look at it they are a set of 5 buttonhole stitches bunched together at the base with the five arms arranged in a fan. This cluster creates an interesting decorative line. 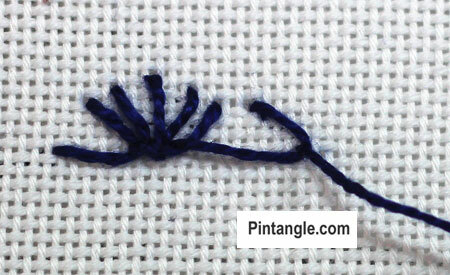 The crown shaped arcs of this stitch can be decorated by adding beads or a French knot. Rosette of Thorns is used in crazy quilting and for decorative borders. This stitch can be worked in a line or on a gradual curve, with arms of the stitch fanning outwards or in a severe curve to form a circle. It is named Rosette of Thorns as it creates a decorative pattern of crown shapes linked together. Rosette of Thorns is a line of grouped buttonhole stitches bunched together at the base with the arms arranged in a fan. 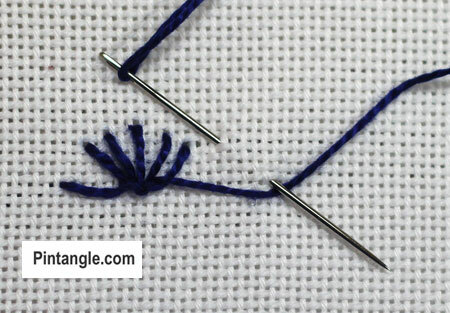 A long buttonhole stitch links each “Crown” of stitches. Work from left to right along an imaginary line. Bring the thread out on the base line inserting the needle at the angle illustrated. 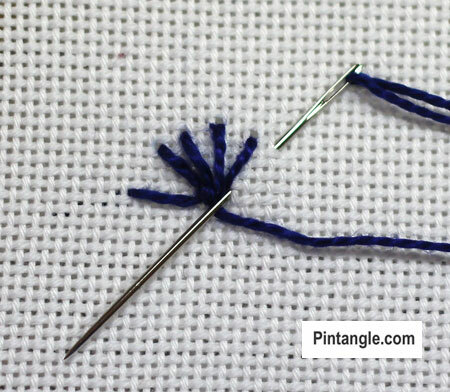 Loop the working thread under the needle point before pulling the needle through the fabric to form the first loop. Repeat this process changing the angle of the needle slightly each time. If you find it difficult to create a neat arc use a coin as a guide. 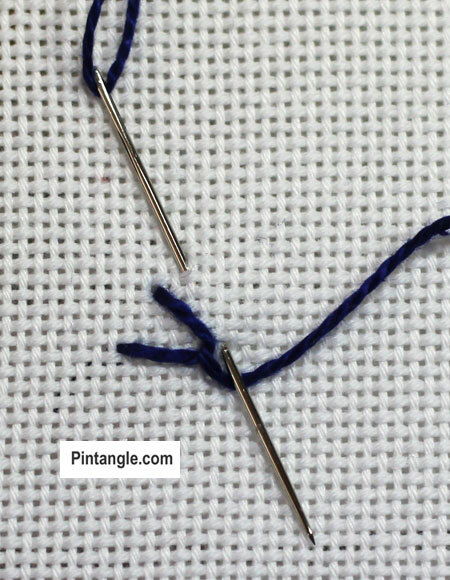 Once the first ‘crown ‘is worked make a long buttonhole stitch. Repeat this pattern of making a cluster of stitches for the crown then a gap, another cluster and so on. You can create many interesting patterns with this stitch by changing how you space the ‘crowns’ or changing the angles or working two lines back to back. 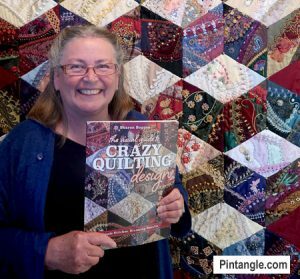 My book The Visual Guide to Crazy Quilting Design: Simple Stitches, Stunning Results shares detailed practical methods about how to design a crazy quilt. From fabric choice, to balancing colour, texture and pattern, with techniques to direct the eye around the block. I cover how to stitch, build decorative seam treatments in interesting and creative ways. My book is profusely illustrated as my aim was to be practical and inspiring. Hello Sharon. I am new to crazy quilting and the embroidery involved. Your website is so interesting and it provides such a huge collection of information. Thank you for the inspiration! 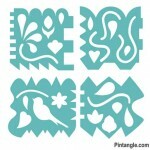 Love the template sets, I have used them all and not just for crazy patch embroidery. The new book is yet another must have. So many ideas and help with stitch formation. Thanks for all you give us !!!! Sharon I’m still drooling over your book and I’ve been through it so many times. I’m new to crazy quilting and you’ve given so many useful instructions and tips. It answers all my questions. I’ve bought your templates too and I love them. Once my sister saw your book she got herself a copy to. Thanks for all your expert directions and ,of course, eye candy! Oh thank you it is nice to know people find it useful as that is what I was aiming for! I am pleased you are enjoying the site – have fun – and dont hold back on the beads I don’t Bling rules!